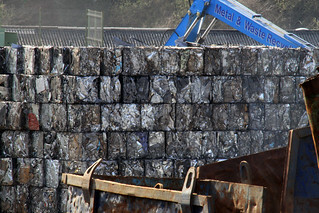 The scrap recycling industry is a boon to the American economy. Scrap metal demolition and recycling sustains thousands of jobs, and its exports improve America’s trade balance. A generation ago, manufacturing was considered the heart of America’s economic health. Today, however, a bright economic future seems to instead lie in green energy innovation, including recycling. Worth $86 billion in 2008 alone, scrap metal recycling is bolstering the economy in several ways. American Jobs. In 2008, 85,000 American jobs were created by recycling in scrap metal demolition. Colorado to Florida, there are tons of metal waiting to be removed and recycled into new structures. Scrap metal recycling sustains family-wage jobs across the country. American Resources. The raw material produced by the scrap metal recycling industry is used in industrial manufacturing around the world. In 2008, the industry exported 44 million metric tons of materials. Because recycled metal is as strong as its virgin counterpart, salvaged metals can be trusted to deliver structural support for bridges, buildings, ships, and countless other applications. American Exports. $28.6 billion—that’s the value of exported scrap commodities in 2008. The scrap recycling industry contributes positively to America’s balance of trade, considered an important metric for overall economic health. Economic stability is a given in scrap metal demolition. Arizona to Azerbaijan, people will always want to erect new buildings, and old buildings will always be the most economic source of metal construction materials. Virgin metal costs considerably more to extract and process than recycled metals. As the world’s largest exporter of ferrous scrap metal, the US will continue to benefit economically from the scrap metal recycling industry. This entry was posted in Scrap Metal Demolition, Scrap Metal Recycling and tagged scrap metal, scrap metal recycling, scrap metal recycling demolition. Bookmark the permalink.